When [Rolling Stone] magazine's cover story came out on Wednesday, the most-talked-about passage was a Trump comment about rival Republican presidential candidate Carly Fiorina. On CNN's New Day this morning, Trump unbelievably claims he wasn't talking about Fiorina's physical appearance, he was talking about her "persona." Yeah, sure he was. Earlier in the day, Dr. Ben Carson had called out Trump for his phony claim to be a regular churchgoing Christian. Trump had lied about that, and was called out on it not just by Carson, but by the minister whose church he falsely claimed to attend on a regular basis. It is long past time for Republicans to kick this liberal, lying, misogynist blowhard to the curb. If this is wholly true then I couldn't agree more with Ogden's take on this! Trump needs to be kicked beyond the curb. he is a misogynist and a terribly ill-mannered individual to boot. 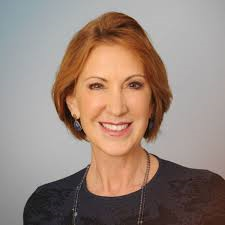 I am a Republican and would love to see Fiorina on the ticket. The dog-faced boy thinks he is a judge in a beauty pageant. I am not exactly eager to see Ms. Fiorina on the ballot but I am literally scared to think that this pinhead might make a run for it. I like Ben Carson though. In a word it's rude. Beyond rude it doesn't apply to the graceful Fiorina; who carries herself well. It's great that Trump has knocked down the inorganic PC barrier but hack sawing a qualified candidate is unnecessary. I, too am a Fiorina fan. I met her some time ago and was incredibly impressed with her thoughtful and conservative stances on issues ranging from the economy to world affairs. In her work as an executive with AT&T, Hewlett Packard and other work since then, she has met with and hammered out major agreements and contracts with world leaders. She is well versed in foreign affairs issues. Reading her autobiography made me even more of a fan. I held secret hopes that she might come to the attention of the general public as a presidential candidate. That she has garnered the presence she has, pleases me greatly. Meeting her in person, I found her to be attractive. It never occurred to me to think of her otherwise. The Donald apparently won't find a woman pleasing unless she is blonde, buxom and willing to put up with his very ugly side. I've been impressed with Carly Fiorina. She's handled herself well so far on the campaign trail, and she's shown a deft touch with the media. Fiorina was a good salesman (salesperson?) promoted too far, too fast, and destroyed one of the great American companies. I remain SHOCKED that anyone would take her seriously after what she did at HP. Her bland lack of remorse or understanding of what a terrible CEOP she was is TERRIFYING. Seriously, ask anyone with any knowledge of the tech industry.